Award winning filmmaker/author John Borowski's (H.H. 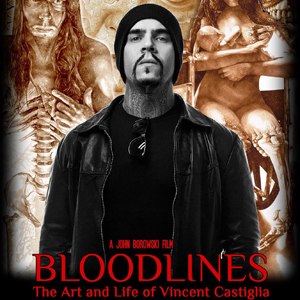 Holmes: America's First Serial Killer) fifth feature documentary film, Bloodlines: The Art And Life Of Vincent Castiglia, will be released in North America on November 13th. The film focuses on artist Castiglia's painful life of abuse, addiction, and recovery while also exploring the reasons why the world renowned artist paints exclusively in human blood. Watch a video trailer below, and pre-order at MVDshop.com. Check out the film website HERE.